Throughout the years, the process of textile making has involved a lot of time and hard work. Millhands/Handmade took a look at the South’s vast textile history, from the growth of industrial mills and their effect on southern families, to regional textile artists working today and keeping handmade techniques alive through traditional practices. 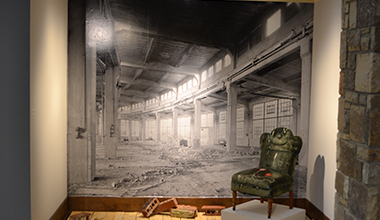 Historic artifacts from the mills and photographs of overworked millhands from the industrial age set the scene and invited viewers to step into the past. Contemporary works by regional artists complimented the display and, in turn, asked viewers to reflect on the past through the present. From Edwina Bringle’s colorful hand-woven fabric and intricate woven shibori works by Catharine Ellis, to painted and embroidered quilts by Jeana Klein and Nava Lubelski’s sculptural fiber explorations, there was much to see. Keeping in mind ideas of labor and laborious practice, this exhibition presented a unique perspective on the everlasting, ever-evolving story of textiles.